I stumbled upon these after a friend told me about them. I was searching for new recipes to make for my son. He loves muffins, waffles and bread. So do I, but I was looking to find a delicious way to give him eggs and these bars were perfect. The first time I gave him a bite, he practically inhaled them. These bars are not specifically meant for little ones of course. I think these are a great way to have a quick breakfast in the morning or a healthy snack in the afternoon for the grown folk. Quinoa is a great vegetarian source of complete protein. This so-called grain is actually a pseudocereal, a group containing edible seeds and fruits that can double as grains. Other foods such as amaranth, buckwheat and chia seeds are also members of this group. Quinoa is rich in iron, fiber and contains only omega-3 and monounsaturated fats. It also is naturally gluten free. The recipe is pretty straightforward and comes together quickly once the quinoa is cooked. Start by cooking your quinoa, once you can see the spiraled germ or tail, the grain is done cooking. Transfer to a clean bowl. Allow to cool in the fridge as you assemble the remaining ingredients. Before starting the recipe, line a 8′ or 9′ square pan with parchment. Spray the bottom and sides of the pan with cooking spray. Cut two strips of the parchment the same width as the pan. Line the pan so there is some excess parchment above each side to allow you to easily lift the bars from the pan once cooled. Spray the parchment on bottom of the pan as well. 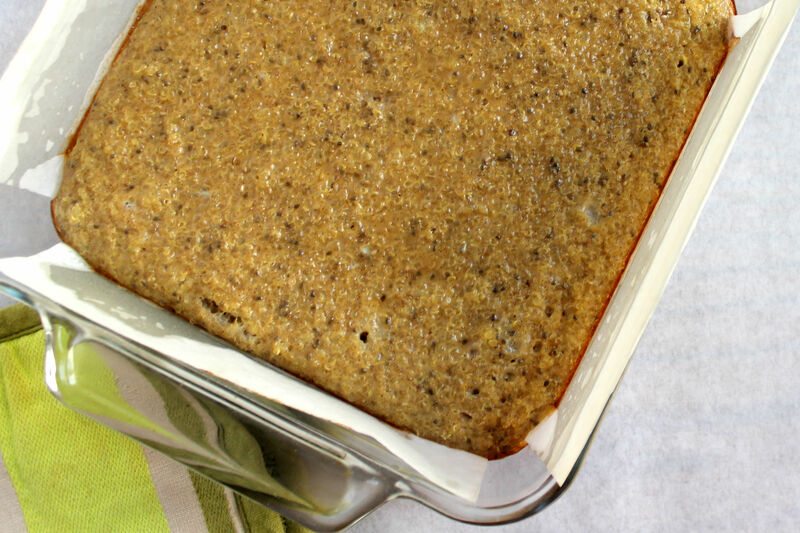 This recipe combines soymilk, eggs, maple syrup, chia seeds, vanilla extract and cinnamon as a binding mixture to fold the quinoa into. Start by whisking the eggs and soymilk together. Next, whisk in the chia seeds and the maple syrup. Followed by the cinnamon and the vanilla extract. Remove your quinoa from the fridge and fold it into the wet mixture. As you combine all the ingredients be sure to break up any lumps of quinoa to ensure everything is nicely coated. Pour the mixture into the prepared baking dish. 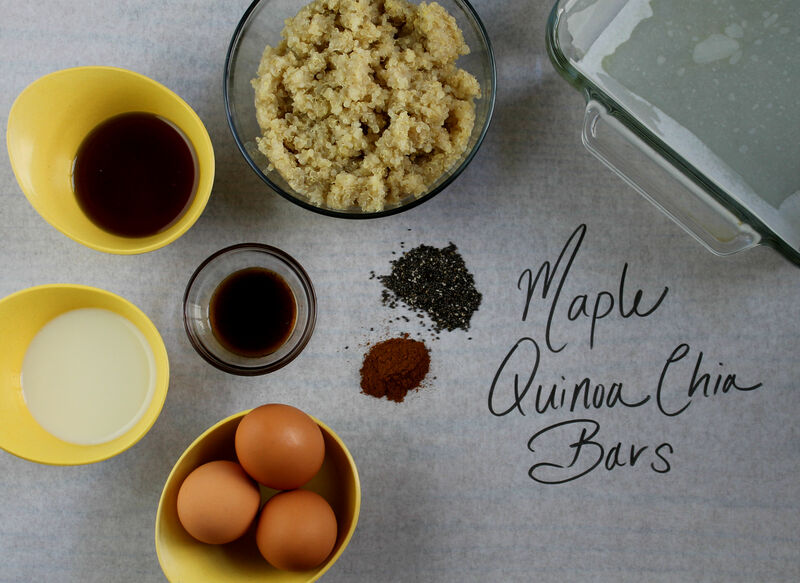 These delicious bars bake for a little over twenty minutes. Allow to cool in the pan before lifting the parchment out. Grease 8" or 9" square pan and line with parchment. Spray parchment on the bottom of pan as well. Rinse the uncooked quinoa in a strainer. Add the quinoa and the 2 cups of water to a small saucepan. Bring to a boil, cover and reduce to medium-low heat for approximately 12-15 minutes. The germ or "tail" will spiral out from the grain and become visible once it is cooked through. Transfer to a bowl and allow to cool in the fridge. Whisk the eggs and soymilk together in a medium bowl. Add the maple syrup, chia seeds, vanilla extract and cinnamon to the bowl. Whisk until thoroughly combined. Add the cooled quinoa to the bowl of wet ingredients and fold together until it is well mixed. Pour into prepared baking pan. Bake for 22-25 minutes. The top will be firm but still springy and the edges will be starting to brown. Allow to cool in the pan before lifting the parchment out. Cut bars to desired size and wrap or bag individually. 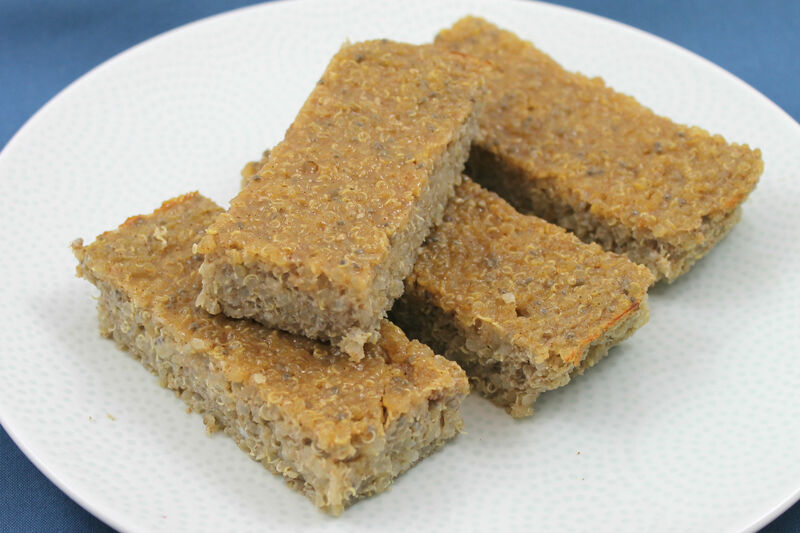 Store bars in the fridge for up to 3 days or freeze individually for longer storage. 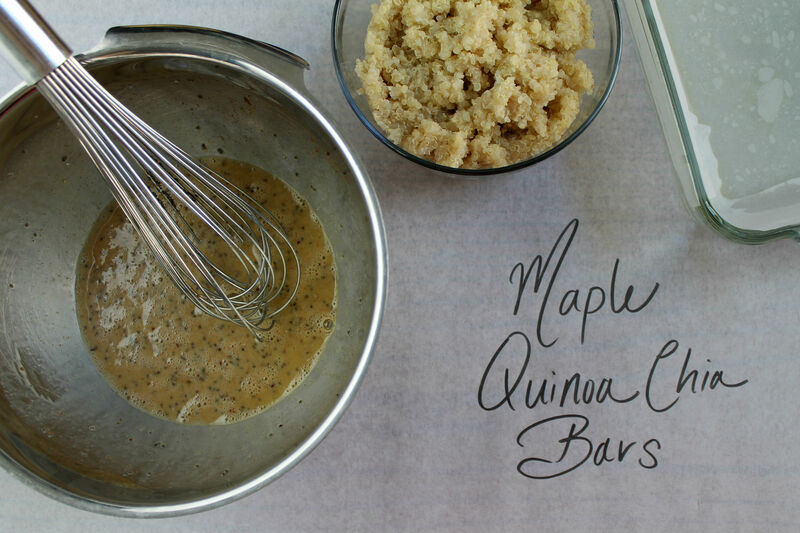 * If you already have cooked Quinoa on hand, use 2 cups for this recipe and proceed as directed. 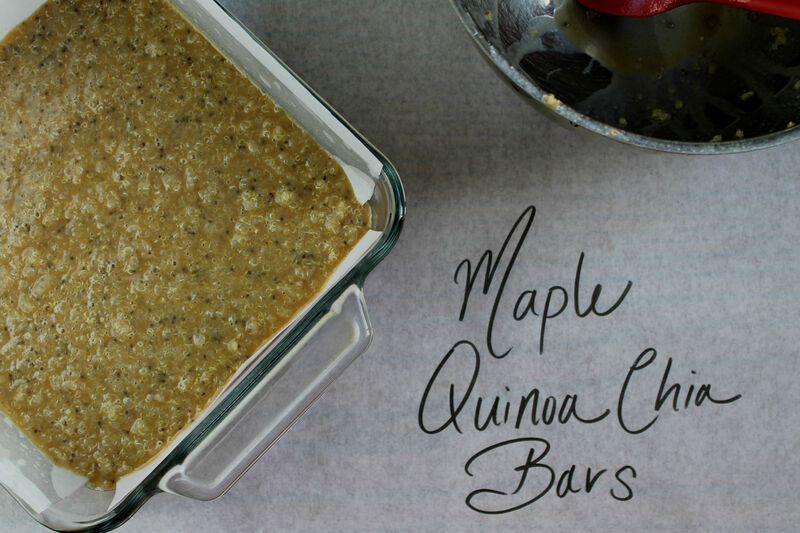 2 Responses to "Maple Quinoa Chia Bars"
I can’t believe I forgot to try them!!!! Next time!!! Interesting. I didn’t realize quinoa and chia seeds were protein. Thanks for the info.